According to the annual USDA report, released moments ago, 12.7% of U.S. households were food insecure in 2015, an improvement from 14.0% the previous year. Households were classified as food secure or food insecure, based on their responses to a set of questions about food-related hardship. In 2008, the last year of the George W. Bush administration, the rate of household food insecurity was 14.6%. In 2012, the most recent presidential election year before the current year, the rate of household food insecurity was 14.5%. 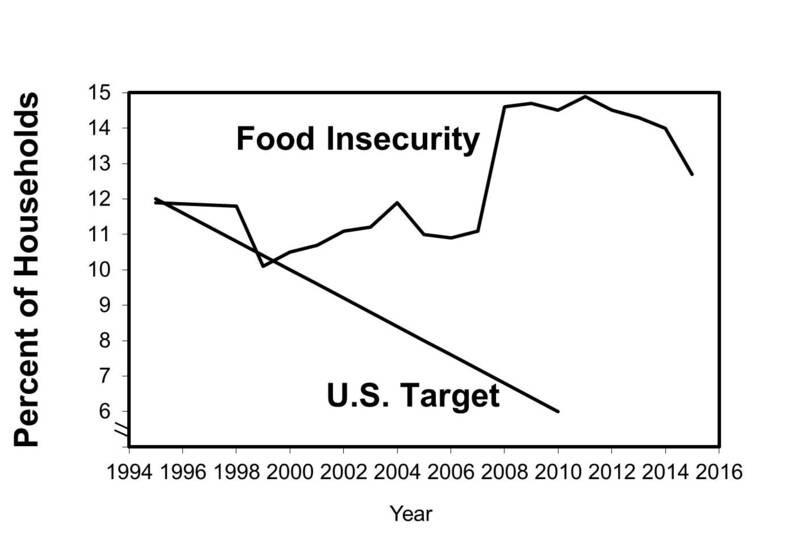 Although it is sometimes said that USDA no longer measures "hunger," this is not really true. One of the clearest statistics in USDA's report each year is the simple question (buried deep in the statistical appendix) about whether the household respondent had been "hungry" at some point in the previous year due to not having enough resources for food. Just 4.2% reported hunger in 2015, down from 4.8% the previous year. 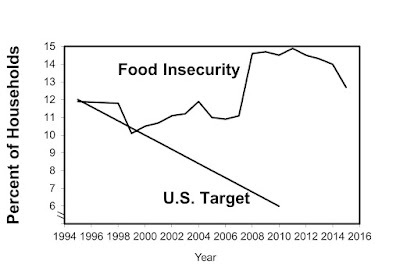 Even with the recent improvement, the United States has fallen terribly far short of national goals for improving food security. There is no fundamental economic or physical barrier preventing our country from achieving lower rates of food insecurity and hunger. Graph by the author. Data source: USDA (2016).